As might be surmised from my previous post, the Head Gardener and I were beginning to doubt the truth of that old adage. So we were delighted when rain began to fall last Sunday. Over the course of the week, we got almost 2 inches of rain here on my corner of Katy. Most of it fell slowly and gently over the course of several hours each day so it had a chance to soak in and do some good. The HG and I are consequently a little happier with how things are looking out back. of any semblance of organization in our iPhoto files. There was one major casualty, however. 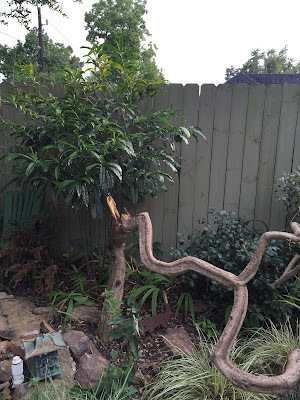 The Persian Vitex (V. trifolia) near the pond hadn't been pruned in a while and the weight of the rain on the limbs proved too much for the trunk to support. It split about 2 feet up from the ground, with most of the tree falling forward into the bed and path. 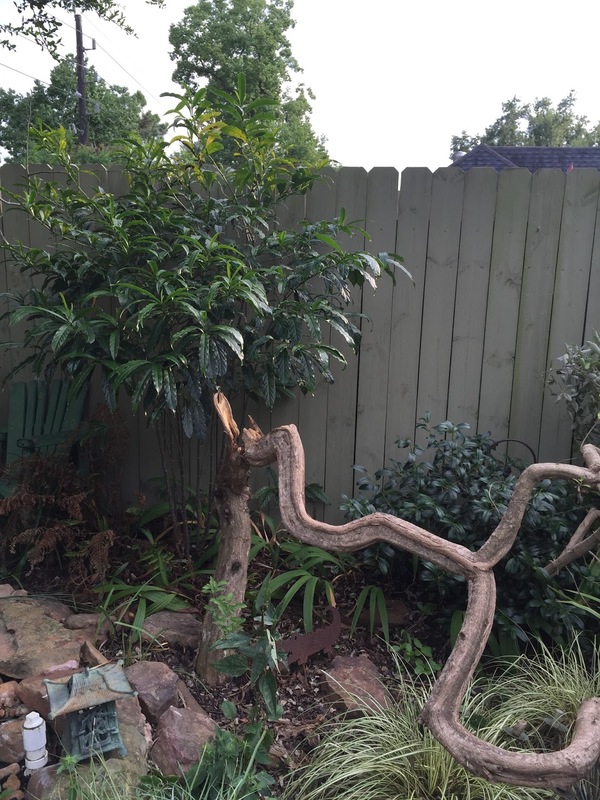 The Persian Vitex as of August 20, 2015, above and below. All is not lost ... there are sprouts at the base of the tree and once the EP takes what's left of the trunk down to the ground, it will regrow. The HG and I are currently in a disagreement about whether or not we had to cut it to the ground after the hard winter of 2009-2010. 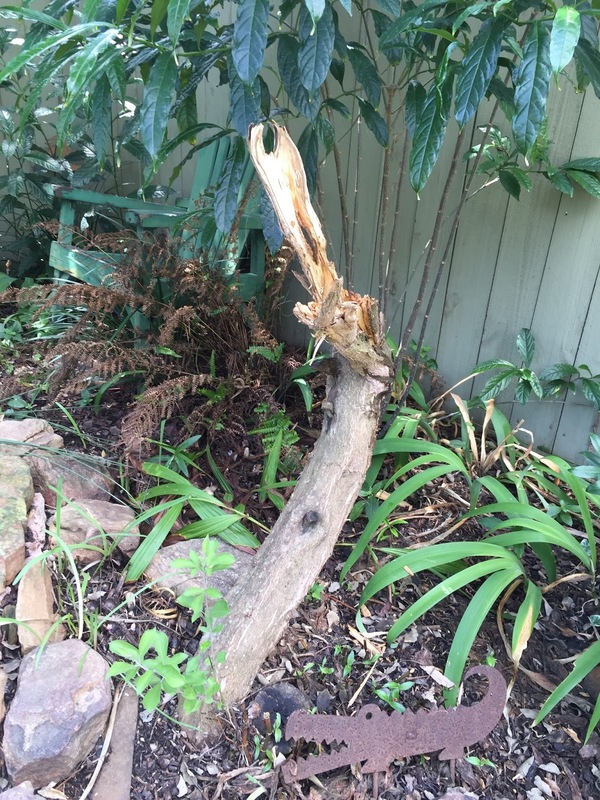 I think we did; she says we pruned it back to live wood and then let it regrow from there. Whatever. The point is that we're not worried we'll lose it. 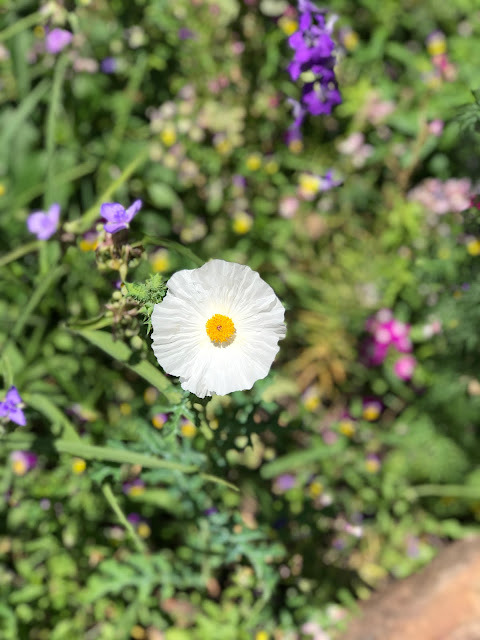 We are, however, pondering whether we want to keep it; replace it with a tree or large shrub that won't need quite as much pruning to keep it in check; or remove it and plant that area with smaller shrubs and perennials. I tend to lean in favor of keeping it: I love how the trunk of this species tends to contort itself in such sculptural ways. It's also a fairly fast growing tree, which is important because there are shade-loving perennials - toad lilies and bletillas - planted under it. I also have to consider how difficult it would be to take it out since the root system is both extensive and healthy. The HG thinks it should go and is currently enamored of the idea of smaller shrubs and perennials. There's no hurry for us to decide. Until The Awful ends and the temperatures drop into the 80s during the day, we have no desire to venture forth even if our activity restrictions are lifted! Producer is not known for his finesse? Not being familiar with vitex it was helpful for me to see these pictures. The good news and the bad news. How lucky you were to receive so much rain. We had only a dribble here. It is amazing how plants respond immediately to rain but when it can't get through the mulch I wonder who it is who benefits. As to your vitex, what a shame. If it si anything like the ordinary vitex then I think you can cut it to the ground. I have done this multiple times trying to kill vitex and it never happens. It always shoots back. I think they recommend cutting to the ground every year. I love that sculptural trunk. How sad but rain is so necessary. Send some my way please.